1987 Luton Town Gatecrash the party. The only thing to be remembered from the 1987-8 season was the Littlewoods Cup Final which though unsuccessful with a 2-3 defeat by Luton Town provided the necessary platform that George Graham needed for the following season. His team was coming together nicely. Alan Smith arrived from Leicester City providing the solid "ball-holder" in attack that Arsenal had for so long been without, Michael Thomas established himself in the first team, and Lee Dixon and Nigel Winterburn were to become the backbone of a defence that would dominate the next decade. Steve Bould also arrived at the end of the season as the an additional defence linchpin. Though apparently unrelated to Arsenal, this history cannot be complete without making mention of the tragedy that unfolded on the terraces at Hillsborough on the 15th April 1989. Liverpool were due to meet Nottingham Forest in an F.A. Cup Semi-Final at Sheffield Wednesday's ground. A day that should have been filled with the joys of football at it's best was grotesquely turned on it's head as 96 Liverpool supporters were crushed to their deaths at the Leppings Lane end of the ground prior to kick-off. As a supporter of Football, I hope that this tragedy can never happen again, and I send my sincerest condolences to all the families and friends that that dreadful Saturday touched. 1989 "Liverpool Be warned, the Championship is coming to North London this season, and you heard it on Capital Gold!" I heard these words uttered on a bright Mayday Monday afternoon after Arsenal had demolished Norwich City (3rd on the league at the time) by five goals to nil. There were still four games to go in a season that showed the World the highs and tragic lows of English football in what has been called "the most exciting title race ever!" There were many games during the 1988-9 season that shone, the first of these came on 27th August 1988 on the opening day of the season. Arsenal had been drawn to play Wimbledon away, and were being quoted at 16-1 odds for the Championship, the odds were about to take a tumble. An away fixture to Wimbledon is never easy, and things looked like they were not going to go Arsenals way when Fashinu scored after 7 minutes. Still, 83 minutes later the game ended, and Arsenal had scored five goals ( Smith 3, Merson, Winterburn) signalling to the league that Arsenal were back with a vengeance. There was a new vibrancy about these Gunners. There defence was still far from rock solid, but they knew how to entertain (infact, it wasn't until the 10th of December that they recorded their first scoreless game, and even then it was probably due to a dubious twice taken penalty after Brian Marwood had scored at the first attempt and been recalled due to encroachment!). By Christmas, Arsenal finally took the lead in the title race . They had scored five against Wimbledon, four against West Ham and Nottingham Forest, while they had put three past Tottenham, Middlesborough and Charlton. The season seemed to have so many highlights. The Nottingham Forest game was one that was viewed by the country as it went live on a Sunday afternoon. Nottingham Forest's early lead through Nigel Clough seemed to only anger a lethargic Arsenal as they flooded forward in attack. They seemed to do everything but score when Sutton the Forest goalie felled Marwood. Unfortunately Sutton redeemed himself, but the onslaught continued culminating with Smith equalizing after cleverly chipping the goalie from close in. The half time score was 1-1, and Arsenal continued to press forward in the second half and were rewarded with goals from Bould, Adams and Marwood (from a wonderfully crafted Winterburn pass). Add to that an Alan Smith shot that rattled the crossbar, and you have a comprehensive victory. Mention also has to be made of two victories against our North London neighbours both Home (2-0 Merson and Thomas) and away (3-2 Winterburn, Marwood, Smith) the three goals came in an action packed nine minute spell and sealed our 5th victory in a row at White Hart Lane. February though saw chinks start to appear in the armour as points started going astray. Queens Park Rangers and Millwall both fought out scoreless draws, while Coventry and Nottingham Forest proved to good for us on the day. Victories against Southampton (3-1), Everton (2-0), Newcastle(1-0), Norwich (5-0) and Middlesborough (1-0) kept us in the race though as Liverpool clawed their way back from a twelve point deficit to sit on our shoulders and then in May to take the lead. There was some "to-ing and fro-ing" before our epic meeting on Friday May 26th 1989. A rearranged fixture at Anfield was fortuitously scheduled to be the very last game of the 1988-9 season. The football league had settled everything except the champions of the First Division. Liverpool had a goal difference that was 4 better than ours. The statisticians had calculated that anything less than a 2-0 victory to Arsenal would see the title head north once again, while 2-0 or more would see the trophy nestling in the Marble Halls for the following season. There could be no more fitting place than Anfield to win the Championship, and on the 26th May 1989 Anfield was a foreboding coliseum filled to the rafters (attendance of 41,783) after Liverpool had won 10 home games straight in '89 and, had the added incentive of completing a second League and F.A. Cup double if the result went their way. All in all, whatever eventuated, the night would indeed be one to remember. Independent Television were also broadcasting the match live around the world and we watched on as Arsenal made history. A tense first half remained goal-less as Arsenal tried to take control of the game but were unable to make a breakthrough. George Graham told his team not to panic, at least they hadn't conceded anything, he told the players to stick to the game-plan and hopefully the rewards would come. So into the second half. Arsenal needed an early breakthrough, and after 52 minutes it looked like we had done it. Amidst what seemed like huge controversy at the time, Alan Smith set Arsenal on their way when he headed Nigel Winterburn's perfect cross just inside Bruce Grobbelaar's far post after Ronnie Whellan had raised his feet dangerously in the face of an on-the-ball David Rocastle. The Liverpool players besieged the referee claiming that Smith had not got a touch to the ball and that the indirect free-kick had been put straight into the net by Winterburn. The referee consulted with his linesman for what seemed like an eternity before he finally pointed towards the centre-spot to confirm that the goal was indeed fair. The Liverpool supporters chants of, "We're gonna win the league" were silenced as they realised that the game was now on a knife-edge. The game took on a whole new complexion as Arsenal concentrated almost solely on attack whilst Liverpool seemed to be more concerned with defending and trying to catch us on the break rather than winning. This tactic was indeed to be their downfall. With minutes ticking away Liverpool became more and more assured of defeat by a single goal on the night but victory in the Championship. All seemed lost when Michael Thomas missed a fairly easy chance with about 15 minutes left. The commentators on the television were discussing how Arsenal had played with, "so much passion a drive", and how fitting it was that we had won at Anfield even though we weren't to win the league. I remember Brian Moore's answer to that little comment being that it would probably mean nothing to us, and oh how right he was..... The game continued with Arsenal pressing for the second goal, and as time began to ebb away. After 88 minutes and 43 seconds, the game stopped as Kevin Richardson needed treatment, Gary Lewin ran onto the pitch to tend to him, and the Liverpool players began congratulating each-other. The Liverpool supporters started chanting "CHAMPIONS, CHAMPIONS" as the clock clicked it's way past the 90 minute mark. Steve McMahon got word from the bench that there was only one minute left and informed his players of the fact (chants of "one minute, one minute" continued to be used to daunt him for many a year afterwards). Finally, after 90 minutes and 27 seconds the game resumed. Brian Moore continued to commentate, "Just a few seconds more for Kenny Dalglish unless Arsenal can mount something absolutely spectacular in the few seconds that remain." Then, with 91 minutes and 22 seconds of the game played, Michael Thomas wrote his name into the history books as the player who scored the winner in the 1988-89 Championship race. Dixon passed the ball upfield to Alan Smith, Smith flicked it on into Thomas' path. The ball bobbled as he ran into the area and calmly, oh so calmly chipped the ball over a diving Grobbelaar as Liverpool lost by two goals at home for the first time since 1986. The Arsenal players, bench and supporters went wild as the the jubilation set in. Arsenal had won their first Championship since 1970-71 and their 9th in all. North London erupted as street parties began and the news media was filled with glorious images/ of red and white. 1990 Winning the Championship was one story, keeping it unfortunately is another..
Whilst the euphoria of the previous season was still on all our minds, the 1989/90 season ended with Arsenal finishing with a credible though disappointing 4th position. It was hugely important however for the addition of a vital cog to the Arsenal defence. George Graham purchased David Seaman from Queens Park Rangers. Seaman proved to be the final addition to a defence comprising of Lee Dixon, Nigel Winterburn, Tony Adams and Steven Bould that would prove to be both the most miserly defence of the following decade and Arsenals backbone. Their record as a defensive unit was to be unrivaled. Graham also brought in Anders Limpar an exciting winger and Andy Linighan from Norwich City to help out our central defence if injuries or suspensions should become a factor. The building blocks for another remarkable season had been laid. 1991 A record breaking Season brings glory once again. The 1990/91 Season was one where Arsenal showed their true character and triumphed over adversity. They had two points deducted by the F.A. For a "brawl" at Old Trafford, and had Captain Tony Adams imprisoned for drink-driving for four months the week before Christmas. Arsenal's reply was to score 74 goals, concede only 18 and finish the season with only one defeat. All this culminated with Arsenal being crowned First Division Champions for the 10th time in their history. Once again, a championship season opened with an away game at Wimbledon. Arsenal won the game 3-0 with goals from Paul Merson, Perry Groves, and an own goal from Keith Curle. Arsenal continued grinding out results, but didn't really achieve anything spectacular until Chelsea visited Highbury in late September. Chelsea were duly dispatched having been beaten 4-1 with goals from Limpar, Dixon, Merson and David Rocastle. On the day, Arsenal were scintillating, and a sun drenched and filled Highbury saw the first real signs that this was a team that could once again regain the title and also play the sort of entertaining and imaginative football that makes us all proud. The next game of real significance came on Saturday 20th October. Arsenal travelled to Old Trafford. Victories away to Manchester United were in general few and far between. Manchester United are never easy to beat, but it was more the way the game was won than the opposition on the day that made it stand out. For the first 40 minutes of the game, Arsenal soaked up the pressure as Manchester United constantly attacked. Then, in the 40th minute came a moment of sheer brilliance as Anders Limpar deceived the Manchester United goal-keeper (Les Sealey) by shooting from an acute angle when all expected him to cross. The ball went just over the line, and even though Sealey parried it out the referee gave the goal. The second half was as toughly contested as any game I have ever seen, when a tackle turned into a revenge lunge, turned into an on-field brawl. 21 of the 22 players were involved in the tussle. The game finished 1-0 to Arsenal, but the repercussions would continue well after the final whistle. Arsenal fined Winterburn, Limpar, Rocastle, Davies and George Graham two weeks wages in a preemptive move ahead of the F.A. Commission that had been called to report on the brawl. The fines however were ignored as the 5 man commission deliberated, and then deducted 2 points from Arsenal and 1 from Manchester United (Arsenal were deducted the extra point due to a skirmish the previous season against Norwich City). Additionally, both clubs were fined £50,000. So, on the Saturday after the points were deducted Arsenal played host to Southampton, and both their resolve and determination were tested. Southampton left Highbury wishing that the league computer had chosen a different day for the fixture after Arsenal comprehensively outplayed them, winning 4-0 on the day with goals from (Smith 2, Merson and Limpar). This was followed by a gritty 3-1 victory against QPR (Rangers took the lead and Arsenal scored three late goals in a "come from behind" thriller) and then, possibly the most significant game of the season. On Wednesday the 28th of November Arsenal faced Manchester United in the 4th Round of the Rumbelows (League) Cup. Arsenal were undefeated in all competitions to this point, and had only conceded 6 goals in 14 league appearances and 1 goal in three Rumbelows Cup matches. Their confidence could only be high after such a wonderful start to the season, but on the night they were "ripped to pieces" in a simply stunning 6-2 defeat. Lee Sharpe scored 3 goals (a couple of which could only be described as stunning), and everything United touched turned to gold. Arsenal had a couple of options after that game, they could be demoralised, or they could learn from their mistakes and use them as a catalyst for the remainder of the season. Four days later on the 2nd of December Arsenal met reigning Champions Liverpool at Highbury. Liverpool led Arsenal in the league by 38 points to 32 at the start of play and their display confirmed the resolve of the team. Arsenal turned on the style with an emphatic 3-0 victory (Merson, Dixon (pen) and Smith). The start of 91 saw us progress in the FA Cup and maintain our unbeaten run in the League. Our 24th league game of the season was against Chelsea at Stamford Bridge. There were 7 London teams in the league in the 1990/91 season (Arsenal, Chelsea, Crystal Palace, Luton Town, QPR, Tottenham, Wimbledon), so sooner or later one of the "local derbies" was "odds-on" to prove our downfall. We lost the game by 2 goals to 1, and once again the Arsenal resolve was to be tested. February to April saw Arsenal once again create and maintain an unbeaten run with impressive victories against Crystal Palace (4-0), Leeds United (2-0), Derby (2-0), Aston Villa (5-0) Sheffield United (2-0) and a second victory against champions Liverpool (1-0). During the same period Arsenal progressed to the Semi-Final of the F.A. Cup with an epic victory against Leeds United (after four games), Shrewsbury and Cambridge. Our Semi-Final against bitter rivals Tottenham was to bring a Wembley appearance and a 3-1 defeat silencing growing talk of a second "double". Unfortunately Arsenal simply didn't perform on the day, and loathed as I am to admit it, Tottenham were worthy winners. Arsenal maintained their momentum in the league however, and moved ahead of Liverpool in the Championship race. On the 6th of May, Liverpool were drawn to play against Nottingham Forest in a morning kick off (they were 4 points behind Arsenal at the start of play with both teams having just two games left), and Arsenal played hosts to Manchester United in the afternoon. If Liverpool failed to beat Forest, Arsenal would be be crowned Champions prior to a ball being kicked in the afternoon. Liverpool lost the game 2-1, and the party atmosphere for 42,229 ensued for the United game with Arsenal taking the pitch as League Champions elect. Arsenal won the game 3-1 with Alan Smith scoring a hat-trick. Unfortunately we conceded a goal that stopped David Seaman from equaling Ray Clemence's record of conceding only 16 goals in a season, but the atmosphere remained "electric". The final game of the season saw Alan Smith score a goal that secured the "golden boot" (the leagues top scorer) for him in a 6-1 victory romp against Coventry City. Arsenal had proven that they were not a "one-hit-wonder" with their Championship victory in 1989, and had done so by losing only one game all season despite having two points deducted by the league. 1992 The future looks Wright Wright WRIGHT!! Whilst Arsenal failed to retain the League Championship (a task that has eluded them since 1935), they played some wonderful football including a number of memorable wins. Notably, a 6-1 home victory against FK Austria (Smith 4, Limpar, Linighan) in the European Cup (they failed at the next hurdle going out to Benfica), a 7-1 home victory against Sheffield Wednesday (Campbell 2, Limpar 2, Smith, Merson and Wright) and a 5-1 victory on the last game of the season (Wright 3 (1 pen), Campbell, Smith). Probably the most memorable event of the season was the signing of Ian Wright from Crystal Palace for £2.5 million . In an almost "Roy Of The Rovers" style story Ian scored on his debut for us in a 1-1 draw in the Rumbelows Cup away to Leicester City on the 25th of September, and then on his full league debut the following Saturday at home to Southampton he signalled his arrival with a hat-trick in-front of a soon-to-be adoring Highbury. Ian scored 26 goals for us that season and added an exuberance and vibrancy to our dressing room that had been missing since the departure of Charlie Nicholas. There was also a noticable low when we lost 2-1 to Wrexham in the third round of the F.A. Cup with George Graham commenting that is was the "lowest point of his career", after Wrexham came back from being a goal down and scored two goals in the last 8 minutes. Unfortunately Wright was suspended for the game due to the slightly darker side of his character, though he was to prove a remarkable "goal-scoring machine", his match-day temprement would be questioned on more than one occassion. We finished 4th in the league Championship race (Leeds United took the trophy from us), but the expectancy for the following season was almost unbearable following an unbeaten run in the league from the start of February which saw us score 41 goals and concede only 15. 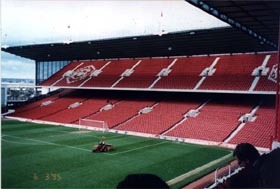 1993 The North bank gets a facelift as Highbury becomes all seater. 1993 Arsenal create history by becoming the first team to win both domestic cup competitions! An opening day 4-2 defeat at the hands of Norwich City was to foretell our league performances for the season. Arsenal showed little if any consistency in the competition. On occasion our defence could "shut-up-shop", but the season contained innumerable 1-0 victories, 0-1 defeats and the ever dreaded 0-0's. We finished in 10th position in what would under normal circumstances have been an incredibly forgeable season. 1996 Life gets complicated when you love one woman and worship eleven men! Once again a major motion picture places Arsenal centre-stage. This time, Colin Firth stars in the adaptation of Nick Hornby's book Fever Pitch. The story follows Paul (a life long obsessed Arsenal supporter) throughout the Arsenal 1988/9 Championship year. Paul meets Sarah and soon discovers that, unlike football, relationships aren't played out in seasons. Their relationship seems to follow the highs and lows of Arsenal's season, including that moment in life when a loved one tries to tell us that "It's only a game", when, we all know that it ISN'T, IT BLOODY ISN'T! !